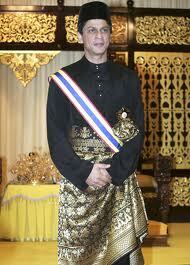 It is strange, this latest debate on the Malacca state government’s knighthood of the Indian actor Shah Rukh Khan. The state defends the award on the grounds that Shah Rukh Khan has done much to promote tourism, that he is an international icon that will bring greater recognition to Malacca. Some opposition leaders and others say that there are much more deserving local talents that should be recognized. Dr. Mahathir said he was ashamed that the award is being questioned. I find it strange because there has been so little controversy over our much abused system of honours and awards until now. The federal government together with all thirteen states issue honours and awards each year. Together, literally thousands are honoured annually. Many have done little or nothing to deserve it. It is widely believed that some of these honours are bought and paid for. The ugly fact is that the whole system has gotten out of control and reeks of abuse and cronyism. We all joke that if you throw a stone anywhere, you are bound to hit a datuk. Or stand in a shopping mall and shout “datuk” and dozens of people will turn around to see who called them. The honours system was originally designed to honour and award citizens who have made outstanding contributions to the state and to the nation. It was meant to express appreciation for, and recognition of, such people as well as to inspire and encourage others to public service. We have fallen far short of this goal; what we have is a mockery. Today, the states fall over each other to award honours to politicians and businessmen. Collecting titles is now part of the game that Malaysia’s elites play, alongside collecting club memberships and fancy cars. If some of these politicians in particular listed all the titles they have on their business card, they would need to have little booklets for business cards. It all rather absurd. It is time that the whole system is revamped. In many countries, an independent advisory committee makes recommendations to the head of state, taking into account nominations sent in by the public. The process is non-political and based on clear criterion. It’s not perfect but it helps ensure that only the truly deserving are recognized and rewarded. Awards and honours then become highly regarded and a true measure of one’s contribution to society and country, not an indication of the depth of one’s pocket or the extent of one’s influence. We should have a similar system at both the federal and state levels. For a start, no politician should be given any honours. They serve the people and that privilege should be reward enough. Likewise with much of the business elite. They have already received their reward in the contracts and other deals which have prospered them. And civil servants too should not qualify simply by virtue of their positions or grade. Lets keep the awards and honours for those who really do make a contribution to society and leave Malaysia a better place than they found it. And one other thing. Let’s make sure that all Malaysians are recognized. It is so demoralizing when one sees the awards list heavily tilted in favour of only one ethnic community. Recognizing the contributions of people irrespective of their ethnic background promotes national unity and patriotism. After all, all of Malaysia’s ethnic communities have contributed to the development of Malaysia. I hope the new opposition-led state governments will show the way and come up with a fair and transparent way of recognizing the contributions of the people. They now have a unique opportunity of demonstrating that they are different in every way from their predecessors by ending the culture of patronage that has so undermined the honours system in our country. Malaysians voted for change when they elected them to office; hopefully it will not be business as usual for them. As for Shah Rukh Khan, let him keep his Malacca award. Anyone who thinks that an award from Malacca is worth anything these days should not be denied one. Besides, he is probably far more deserving and will certainly do more for Malacca by his presence than most of the others on the list.